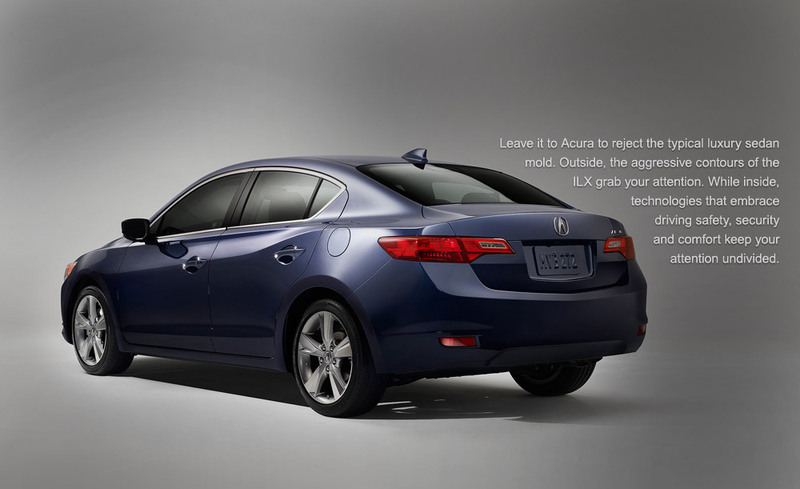 Acura: How do you get people back into your showrooms if you’re the neglected quasi-luxury brand of Honda? Acura thinks the first step is to offer a luxury version of the Honda Civic and remake it’s flagship RL that could only find 38 buyers last month. 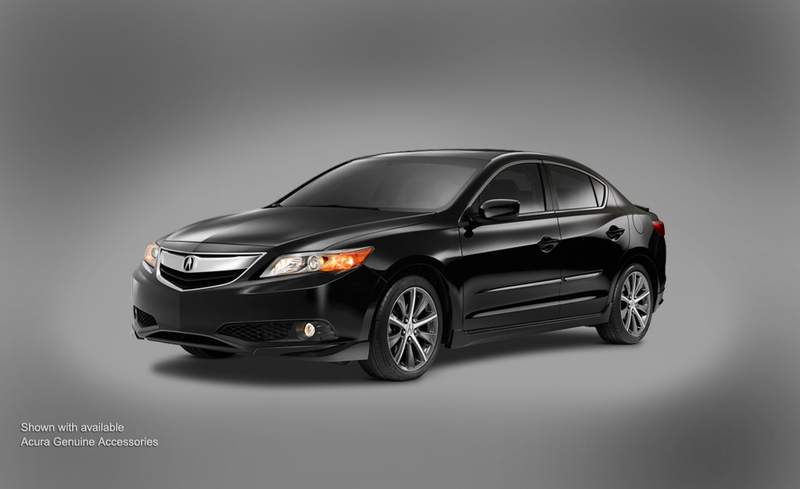 The 2013 Acura ILX is coming to showrooms in the 2nd quarter of 2012 – so soon. It will have three powertrain choices: A 2.0L 4-cylinder engine with a 5-speed automatic (Civic); a 2.4L 4-cylinder with a 6-speed manual transmission (Civic Si) and a 1.5L 4-cylinder engine with a hybrid electric motor and an automatic (CVT) transmission (Civic Hybrid). The styling and interior design far surpasses the current un-loved Civic. 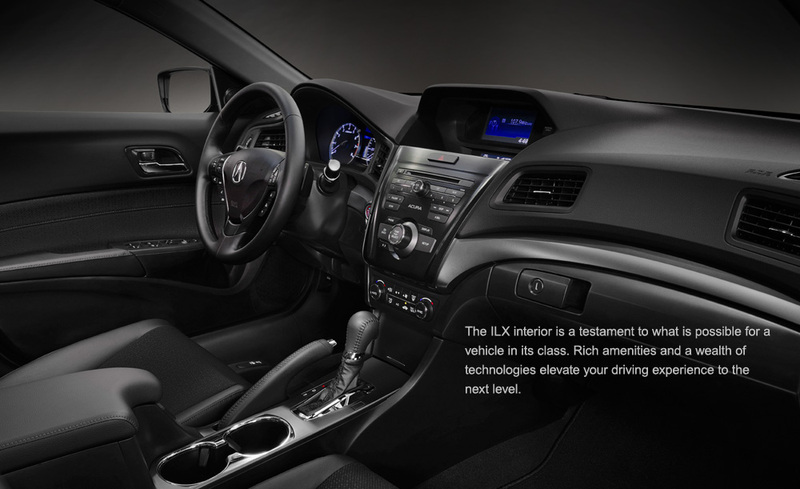 2013 Acura ILX interior - much better than the Civic! Once again, Honda/Acura has rejected the idea of a proper rear-drive luxury flagship for Acura. The current RL has been languishing on the market, mostly unchanged, since 2005. No one bought the $50,000+ RL in 2005 because the TL, Acura’s version of the Honda Accord, is about the same size, equally well-equipped and is $10 – $15,000 LESS. Sales of the RL for all of 2011 were only 1,096 units. And Acura dealers probably had to give those away at steep discounts. 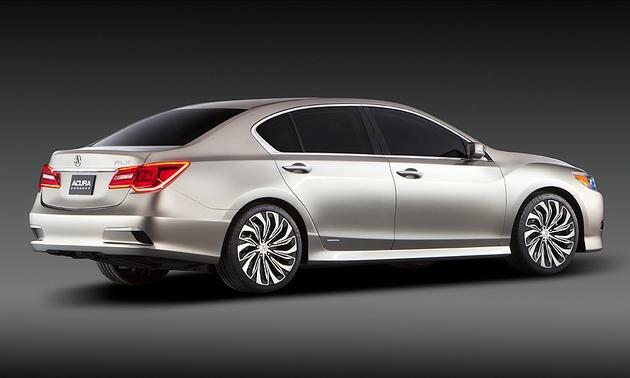 At the New York show, Acura previewed the new RLX in concept form. There aren’t many details, but it will continue to be a front-drive/AWD car with a V6 engine and the possibility of a hybrid drivetrain. 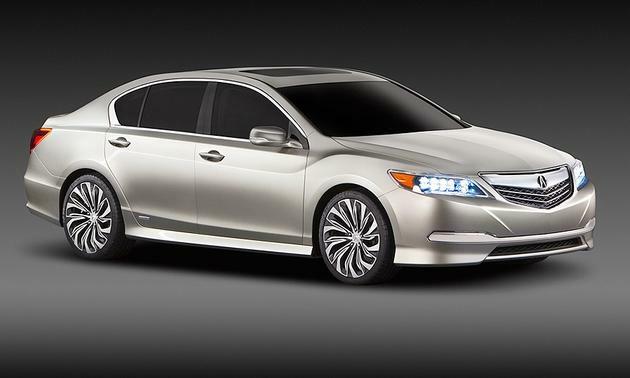 The RLX Concept seems to be a very conservative sedan with an Acura grille. It's nice, but as a flagship statement and as the material expression of Honda's engineering prowess, I'm not impressed. The RLX Concept is very Japanese, but not very distinguishable in the very crowded near-luxury field. 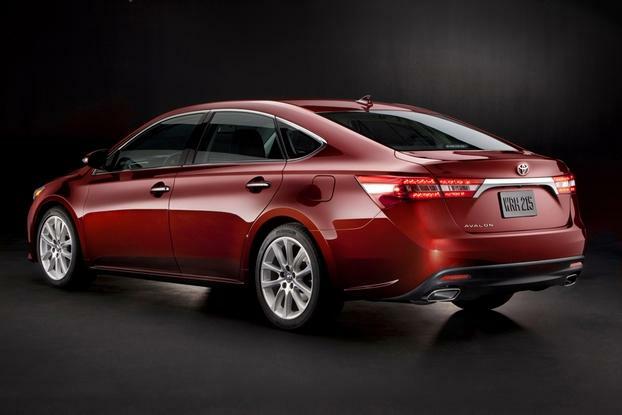 You know, the 2013 Toyota Avalon looks like this too. 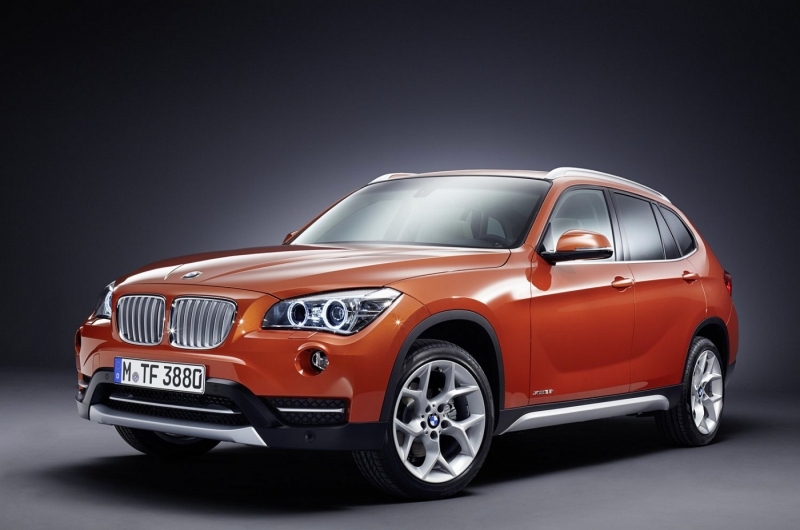 BMW: BMW has finally decided to bring the X1, it’s small SUV to the United States. The X1 is nearly identical in size to the outgoing 3-series wagon because it’s made on the same platform in the same factory in Germany. It weighs only 3,527 pounds, a whopping 585 pounds lighter and 6.5 inches shorter than the X3. 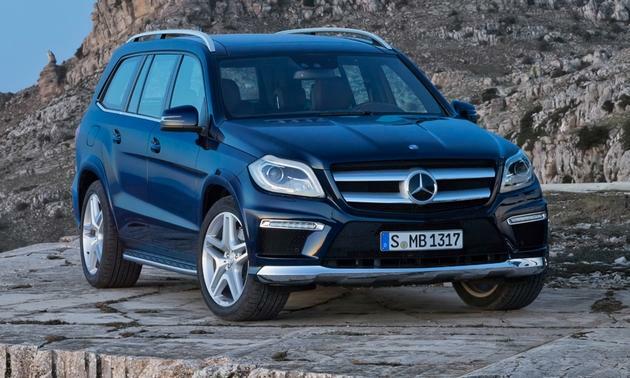 It’s main competition will be the Mercedes-Benz GLK. The X1 sDrive28i will be the entry-level rear-drive model with the company’s new 2.0L dual turbo 240 hp engine, starting at $31,545. BMW will also offer the X1 with its excellent 3.0L inline dual-turbo six with 300 hp, starting at $39,345. Missing, as usual, is a 4-cylinder turbo-diesel engine. The X1 hasn’t yet been officially rated by the EPA, but BMW hints that in base rear-drive form, it should get around 23 mpg in the city and an impressive 34 mpg on the highway. Given its more compact size, low entry level price, American’s never-ending love for SUVs and impressive fuel economy, I think the little X1 will be a hit. 2013 BMW X1. It looks like the X3, but with a little less cargo space. I'm thankful that you can still buy it without BMW's xDrive AWD system. 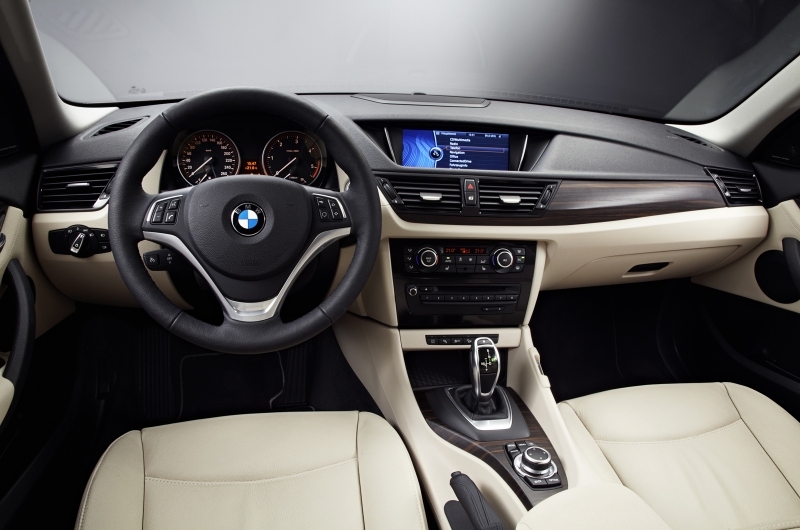 The interior of the 2013 X1 is very BMW-familiar. Since the X1 is much more closely-related to the 2011 3-series, it lacks the austere interior of the current 1-series coupe/convertible. Buick: Oh, General Motors, I know you’re trying to get us to like Buick. You’ve put out some interesting products. The new LaCrosse is competent, as is the Regal and the all-new Verano. Sales for the first quarter of 2012 are down about 16.5% from the same period last year, so there are high hopes that the Verano and the newly-refreshed 2013 Enclave will spice up sales. The large Enclave SUV is based on GM’s Lambda platform that underpins corporate cousins the Chevy Traverse and GMC Acadia. Here are some pictures, see if you can see if you can spot the changes (hint, they are hard to see). 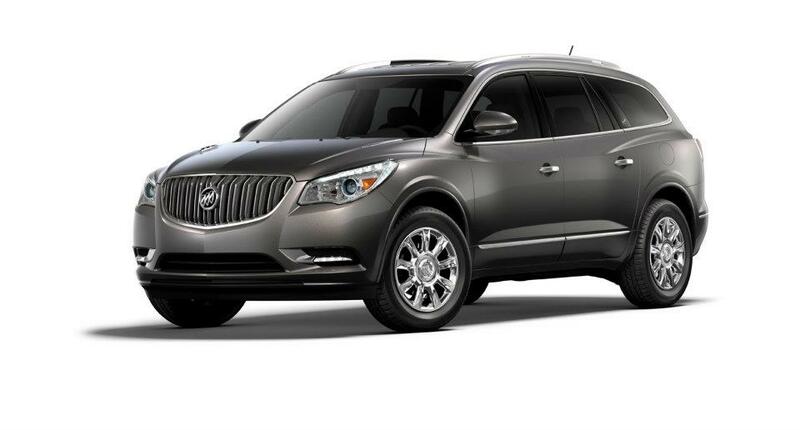 The 2013 Buick Enclave has only subtle styling changes. Nothing radical. The headlight array is different, giving the front a more aggressive look. The center stack on the dash has an upgraded infotainment system and I'm told that the wood surrounding it is real, even if it looks fake. Chevrolet: It’s happened, Chevrolet has made an Impala that may find a home outside its natural habitat – corporate rental fleets. Based on the same platform as the Buick LaCrosse and the upcoming Cadillac XTS temporary flagship, the handsome new Impala leaps into showrooms early in 2013 as a 2014 model. The base engine is a 2.5L 4-cylinder engine making 195 hp and 187 lb-ft of torque. Optional will be the same 2.4 liter four with GM’s eAssist mild hybrid technology. The top engine is the ubiquitous 3.6 liter V6 making 303 hp and 264 lb-ft of torque. A six-speed automatic is standard on models. 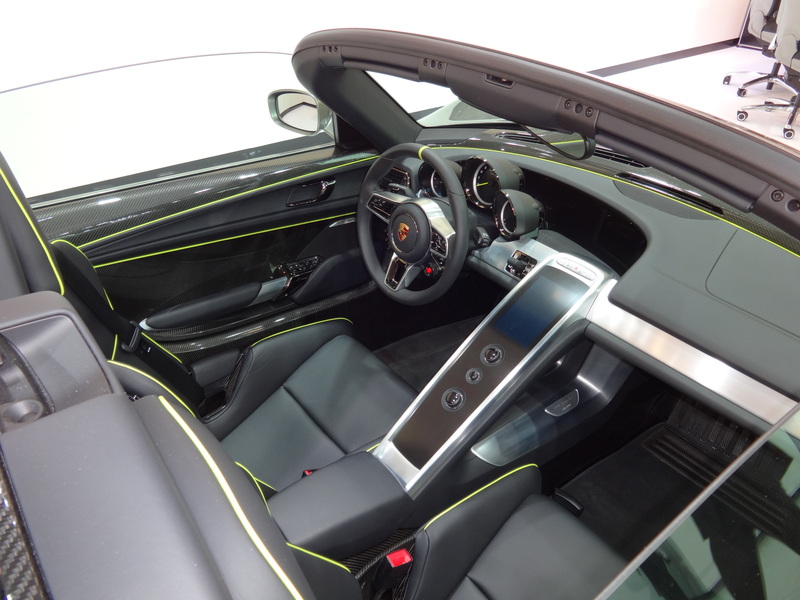 The upgraded interior materials look good and are soft to the touch. French stitching abounds over the dashtop, the instrument panel cowel and the center control panel. Another feature is the same active noise cancellation system also found in the LaCrosse. The good news is that the Impala is finally competitive. The bad news is that its direct competitor is the Buick LaCrosse. GM’s eating its own children, again. 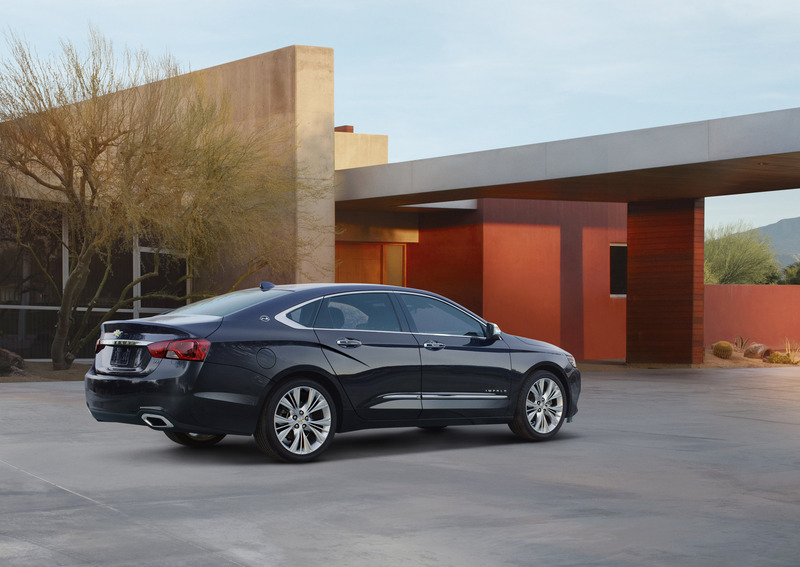 The handsome new 2014 Chevy Impala is a Buick LaCrosse with less bling. Another nice picture of the 2014 Chevy Impala. Cool house too. It looks like the photo shoot was in Palm Springs. The 2014 Impala has the aura of a near-luxury car. Good for Chevy, but not so good for corporate sister Buick. Why pay for a Buick when you can get essentially the same thing for thousands less with a Chevy badge? The detailing and materials for the interior have advanced at least two generations over the ancient rental fleet Impala currently on-sale. The Chevy MyLink infotainment system, including native apps and touch-screen navigation look pretty cool here. Fisker: The Fisker Karma is the flashy king of hybrids, but it’s also the price king. As part of Fisker’s plan to expand its line up and create a volume nameplate, Fisker had planned on purchasing and re-purposing an old GM plant in Delaware with a Department of Energy loan. The project car was code named Nina. In a rapidly changing environment for hybrids and electric cars, Fisker is now waffling on the Delaware plant and the DOE loan has been suspended. 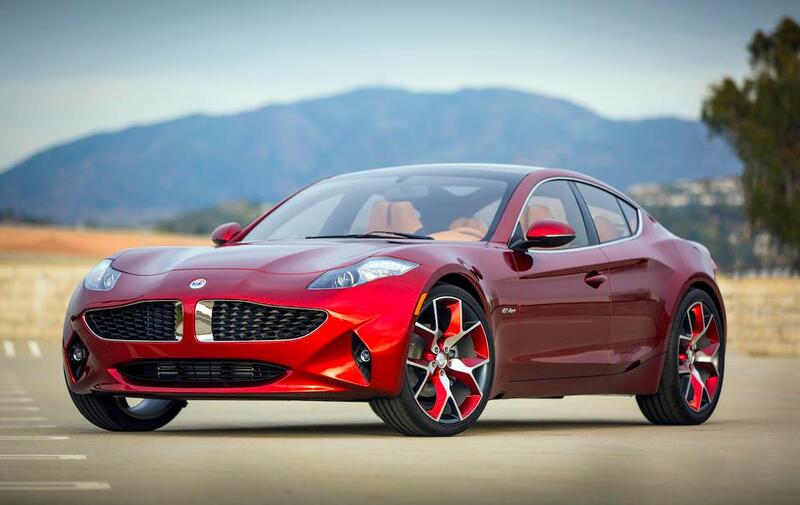 Fisker says it has secured private funding for the new car. But to tease us all, Fisker has released pictures of Project Nina, now renamed the Atlantic. It has strong design ties to the Karma, but this “affordable” plug-in hybrid – an extended range electric vehicle – is supposed to have a price tag in the $45,000 range (half the price of the Karma). It ditches the 2.0L GM EcoTec engine in the Karma in favor of a BMW-sourced 2.0L inline 4 cylinder engine. A123 systems is still scheduled to supply the battery pack, but after the problems with the battery pack on the Karma, that could change too. Henrik Fisker certainly has a flair for design. There are no bad angles on this 2014 (?) Atlantic ErEV. There will be no confusion that this is a Fisker. Style is abundant. 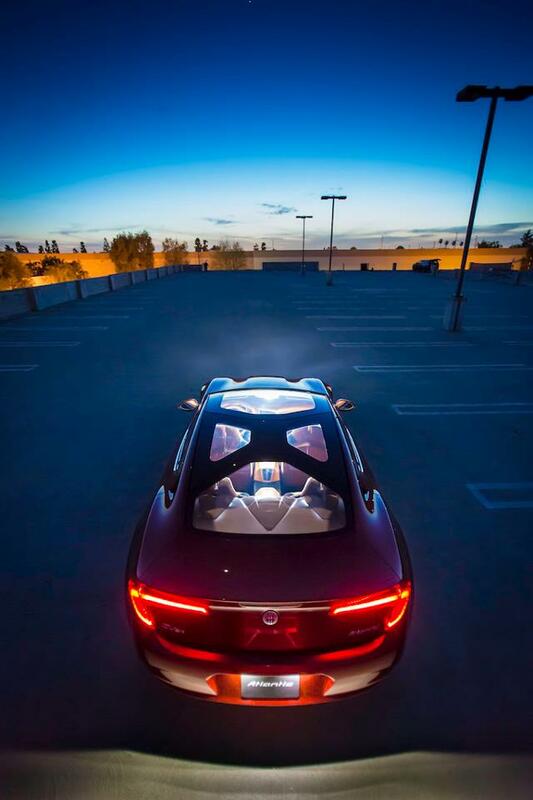 The Atlantic design prototype’s glass roof shows off a ridged ‘spider’ structure. 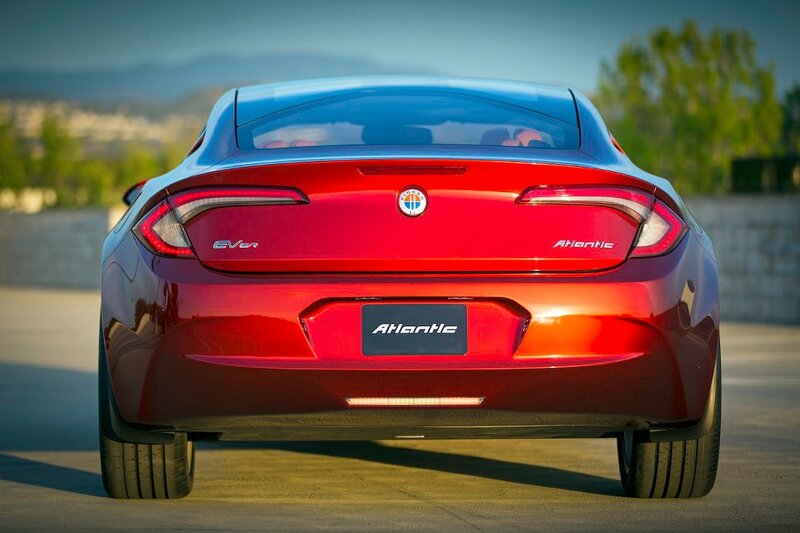 According to Fisker, this incredibly strong construction also allows the Atlantic to offer a remarkable amount of rear headroom for a car with its sleek, coupe-like stance. Hyundai: While Hyundai didn’t wow us with a flashy show car or a zippy variant like the Veloster, we did get to see the 2013 Santa Fe, which is a key crossover in Hyundai’s portfolio. 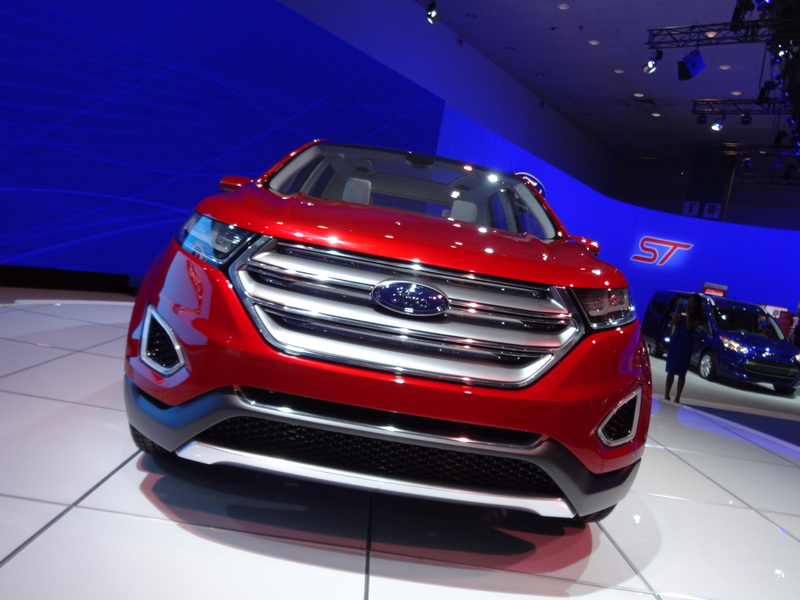 The big news, besides the fresh, “Fluidic Sculpture” sheet metal and upgraded interior, was that the Santa Fe would be available in normal and long-wheel base versions. This sets the stage for the exit of the Hyundai’s large crossover, the Veracruz, which found only 622 homes last month. In other words, everyone forgot it existed. The two row Santa Fe Sport has a base 2.4L direct-inject 4-cylinder engine good for 190 hp. 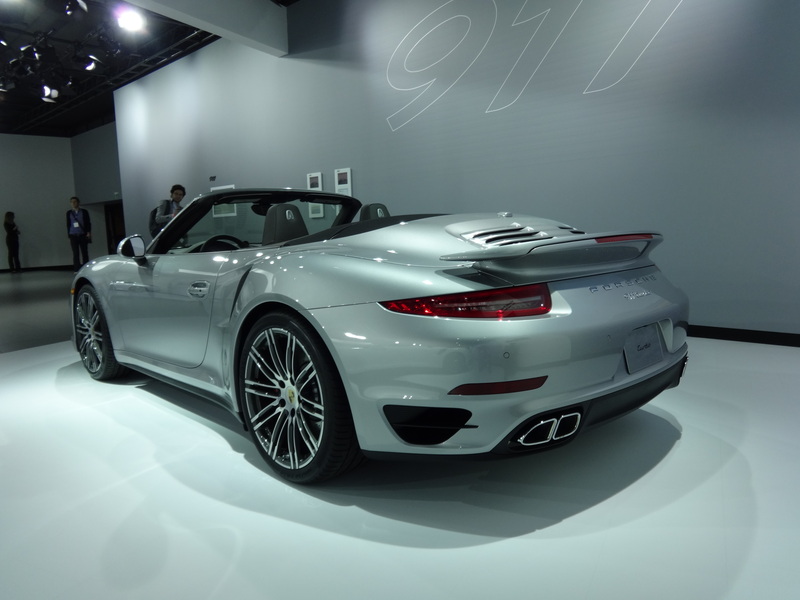 A 2.0L direct-inject turbo four making 264 hp is optional. The three row Santa Fe’s only engine is a 3.3L direct-inject V6 good for 290 hp. All versions have a standard in-house sourced six-speed automatic and are available in both front and all-wheel drive. 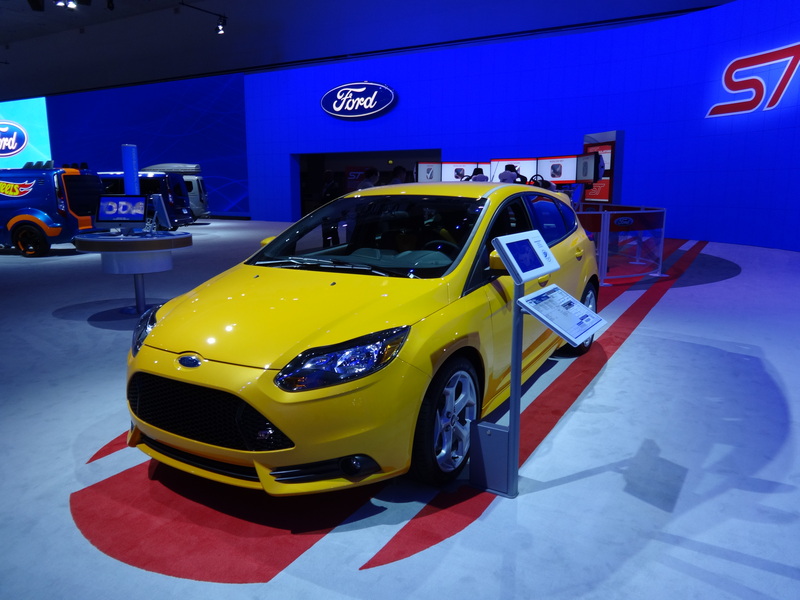 The base Sport with front drive is good up to 33 mpg. The Sport Turbo is only slightly less at 31 mpg. 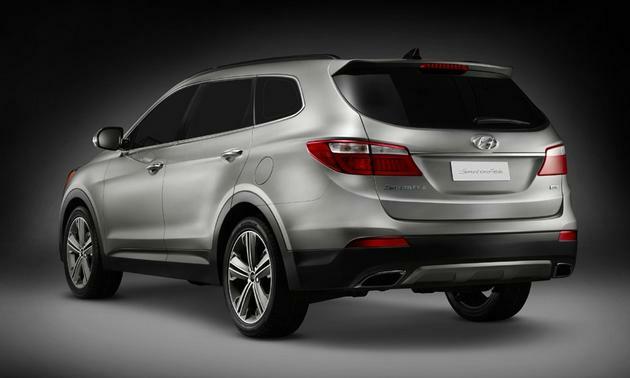 As a sign of a new automotive trend, the 2013 Santa Fe Sport is 266 pounds less than the outgoing model. Less weight = more efficient. Prices haven’t been released, but the base Santa Fe Sport shouldn’t be much more than the outgoing base Santa Fe which is $23,225. 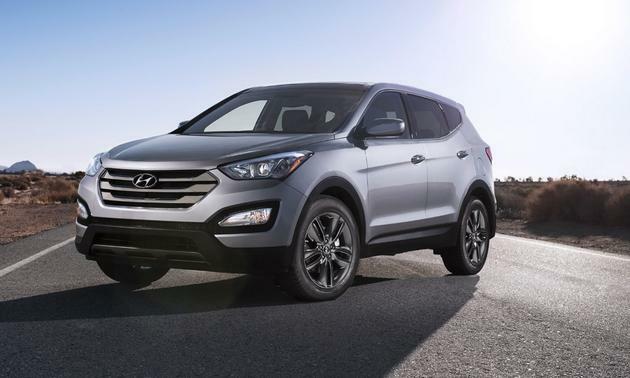 2013 Hyundai Santa Fe Sport has a more aggressive trapezoidal grille. The 2013 Santa Fe's smaller "D" pillar should help side visibility. 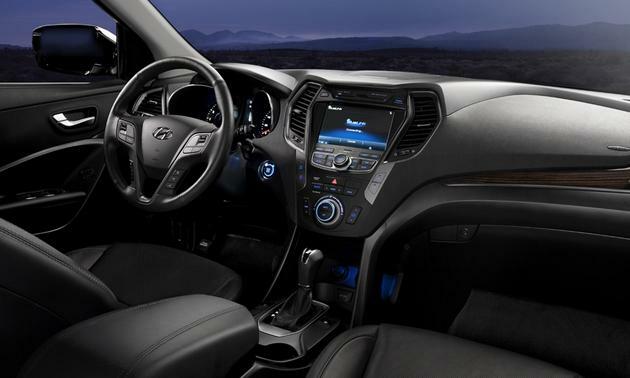 The interior of the 2013 Santa Fe looks rich and handsome. I like the new big navigation screen. 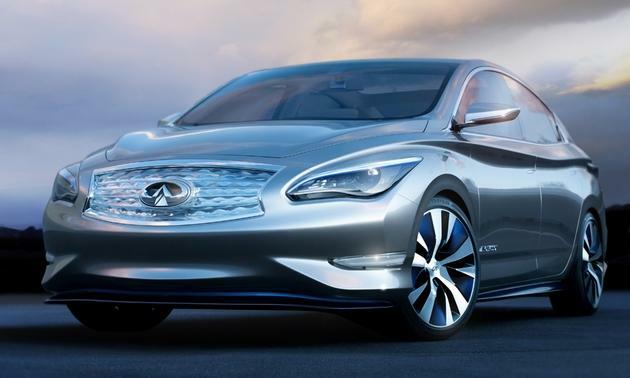 Infiniti: Nissan’s electric branch grew a new Leaf and this time it’s called the LE. Wow, Infiniti, Nissan’s luxury division, couldn’t come up with a better name than that? While the Nissan Leaf can charitably be described as “geek chic,” the Infiniti LE got all the designer duds and more LED bobbles than Lady Gaga at a rave. The Infiniti LE Concept is around the size of the Leaf, but it has a trunk, not a hatchback and bears more than a passing resemblance to the Hyundai Elantra. Hyundai calls it “Fluidic Sculpture” while Infiniti calls it “Hamon” (ripple) design. Based on the Leaf’s platform, the LE packs a 24 kWh lithium-ion battery pack good for a claimed 100 miles. Nissan claimed the same thing for the Leaf, but 70 miles was more realistic in normal driving in So Cal warm weather. The headline technology is the wireless inductive energy flow charging system. A pad would be installed on your garage floor, connected to the electricity source. Park your EV over the pad and a receptor at the bottom of the car siphons electrons through microwaves. Nissan says the LE could be in showrooms in two years; however it’s unclear which will be ready first: the car or the charging system. Infiniti isn’t talking price, but the Leaf SL starts at $37,250. Figure the Infiniti has to be at least $10,000 more. The Infiniti LE Concept EV. It shimmers in the electric blue LEDs. 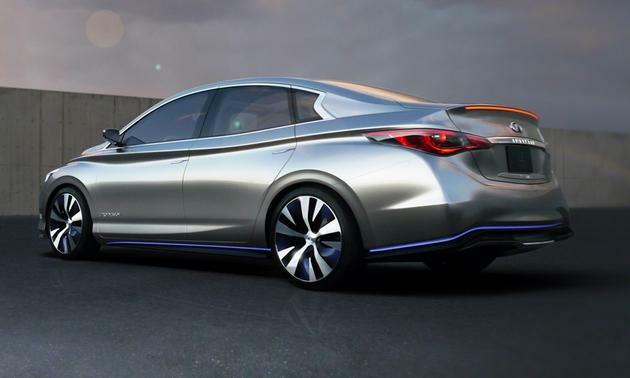 The Infiniti LE Concept reminds me of the Hyundai Elantra. That's both good and bad. I think the Elantra sports a modern, flowing design; but an Infiniti is supposed to be an expensive luxury car, not an entry-level subcompact. 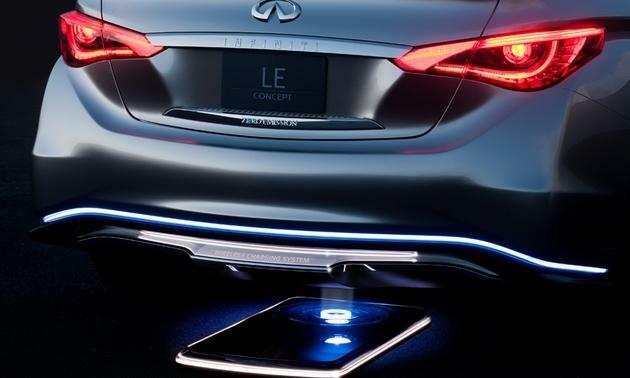 Inductive charging is a cool idea that can't be here fast enough. 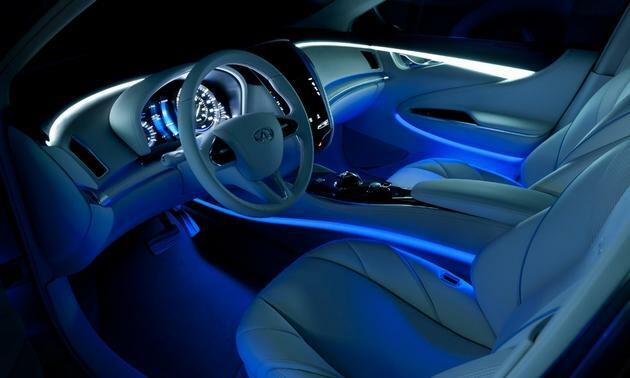 The interior of the Infiniti LE Concept. Infiniti can't get enough of those blue LEDs. It does make for a futuristic vibe. 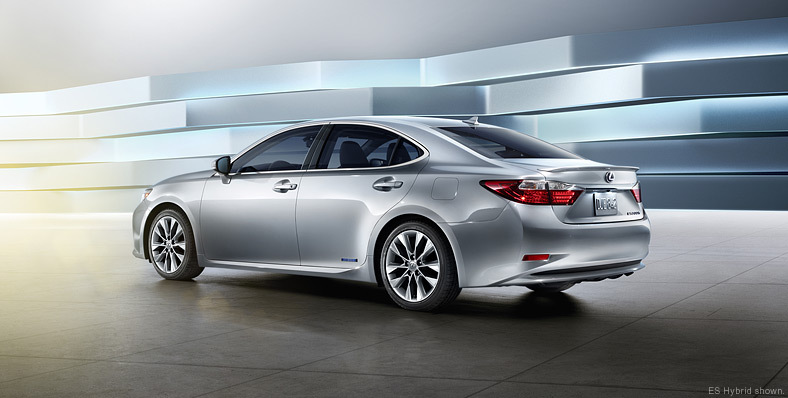 Lexus: With the new Toyota Camry introduced last year, it was only a matter of time before a new Lexus ES rolled out. 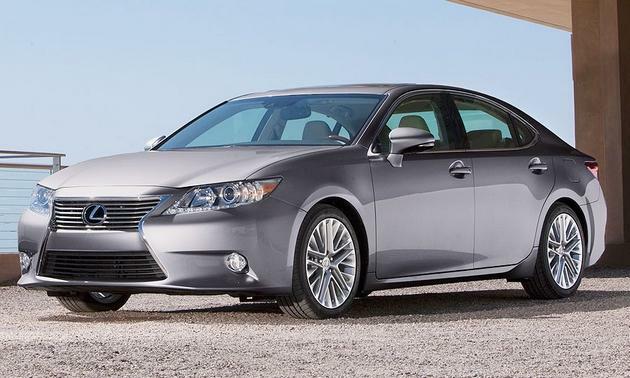 The 2013 Lexus ES350 is a welcome change to its dowdy predecessor. The new ES sports modern fluidic styling favored by Asian manufacturers, along with the slightly risky “spindle” face first introduced earlier this year on the larger rear-drive GS350. Power will come from an updated version of Toyota’s 3.5L direct-inject V6. In the Camry, the non-direct injection engine makes 268 hp and in the GS the direct inject engine is rated at 306 hp. However for me, the real “excitement” (if that word can be applied to a Lexus) is that the new ES gets a much needed, sweeping revision of its interior. Banished to history is the ugly center stack tombstone in favor of the handsome horizontal dash lines first seen in the GS. Lexus didn't take much risk with the 2013 ES350; however, it certainly is modern and some think the spindle grille makes it a bit aggressive. It just looks like a hooked fish to me. The sweeping horizontal lines of the 2013 ES interior is a complete 180 from its predecessor. The optional bamboo wood looks rich and it's real. For others, though, the big news was that there will be an ES300h hybrid for the first time. Naturally, it will be based on the 2012 Toyota Camry Hybrid, so it won’t be saddled with the unpopular wildebeest-look of the hybrid-only Lexus HS250h. The Camry Hybrid has a combined fuel economy of 40 mpg, so I’d expect the heavier Lexus to be slightly less. 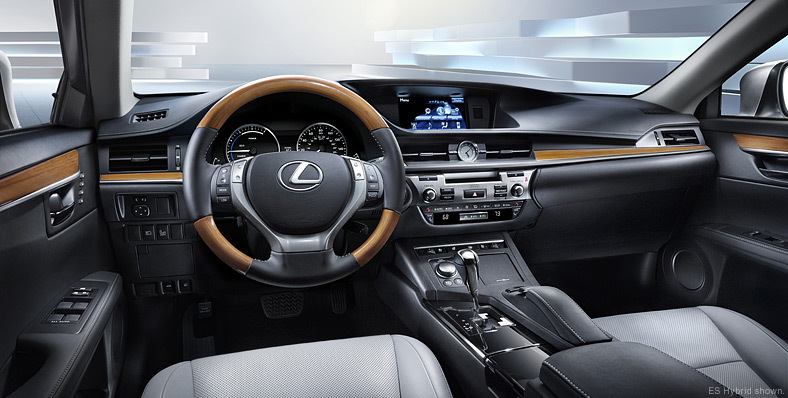 An interior detail of the 2013 Lexus ES Hybrid. Lincoln: Can Ford’s renaissance spread to Lincoln? Ford’s only remaining “luxury” brand is Lincoln. The venerable luxury brand, once famous for such amazing products as the 1938 Lincoln-Zephyr or the 1963 Continental “slab side” “suicide door” convertible (think Kennedy assignation), has been used and abused for decades and is in the hospital on life support. Every current Lincoln is a rebadged Ford and Lincoln has been starved of a proper flagship rear-drive sedan for decades. It’s going to take time and money, lots of money, to revive Lincoln and find new customers. The last of Lincoln’s old-school customers were abandon when Ford threw the last shovel of dirt over the long-dug grave of the venerable rear-drive Town Car/Crown Victoria. 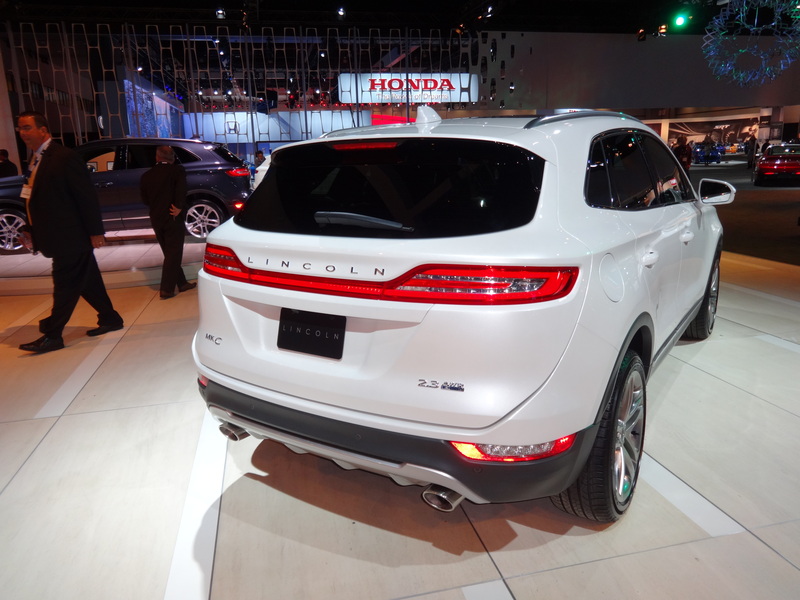 Somehow, a rebadged Taurus – the MKS – was supposed to take its place. It didn’t. 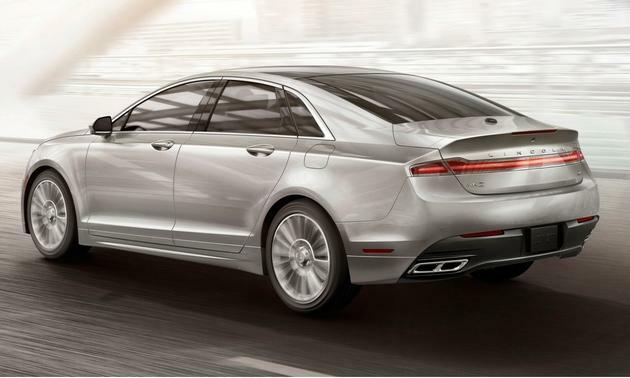 The first step for the new, new Lincoln is the 2013 MKZ. Still saddled with the ridiculous three letter meaningless nameplate, the MKZ is, once again, a rebadged Ford Fusion. 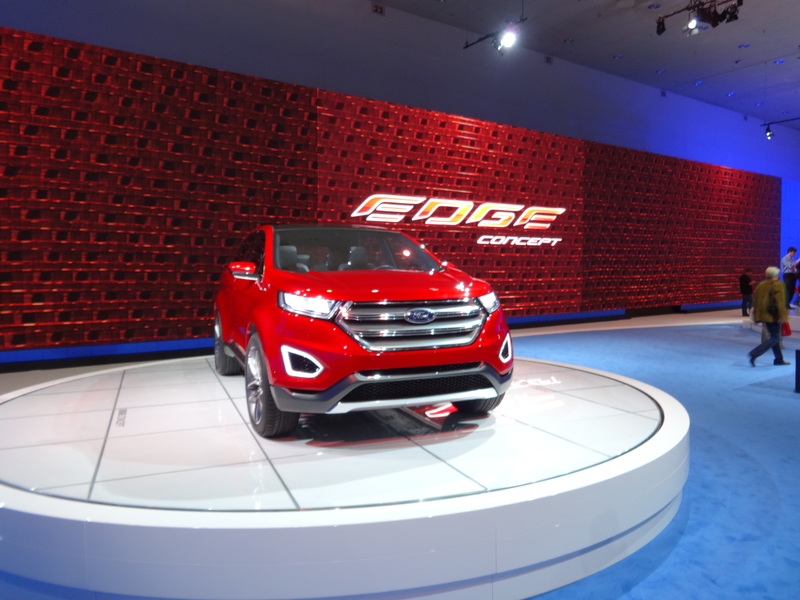 However, this time, Ford thinks that there is enough sheet metal, interior and engine distinction to quell the critics and be the platform for another “relaunch” of the brand. The new MKZ’s base engine will be Ford’s excellent 2.0L direct-inject EcoBoost good for 240 hp. While the Fusion doesn’t get a V6 this time around, the Lincoln MKZ will be available with a 300 hp 3.7L direct-inject V6. The MKZ hybrid will have the same system in the Fusion Hybrid that Ford says will be good for 41 mpg in the city/36 highway. 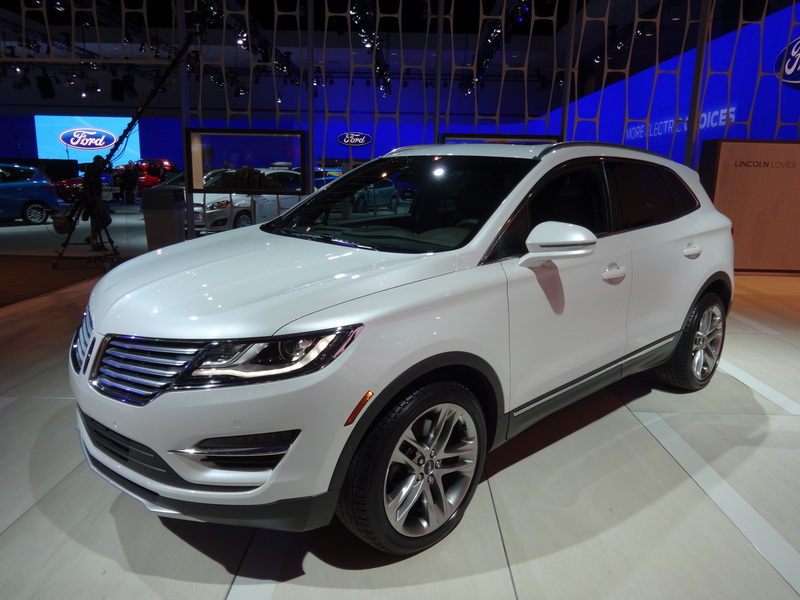 Lincoln also promises all the latest in electronic safety wizardry, active noise cancellation and, for the first time, “world-class customer service,” all-new showrooms and a staff trained at the (groan) Lincoln Academy. In short, Lincoln is going after a Lexus customer experience. Hum… we will see how that works out. Overall, I love the new MKZ, but its Fusion sister is also sensational. At least this time around, you can’t go wrong with either product. 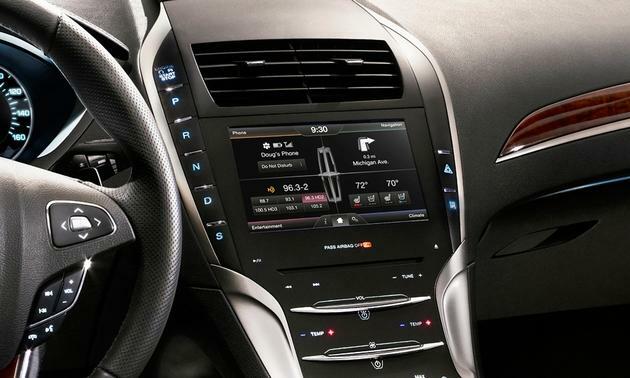 The 2013 Lincoln MKZ. This is the new face of Lincoln. It's high style, but it does nothing for me. It just looks derivative. The sheet metal is well rendered and provides style lines and V-shaped hood stamping provides visual interest. The LED running lights are nice, but almost a must-have cliche these days. The coupe-like styling of the 2013 MKZ is in vogue, but the integrated real spoiler and full-width horizontal taillights are quite handsome, sporty and a cool touch. 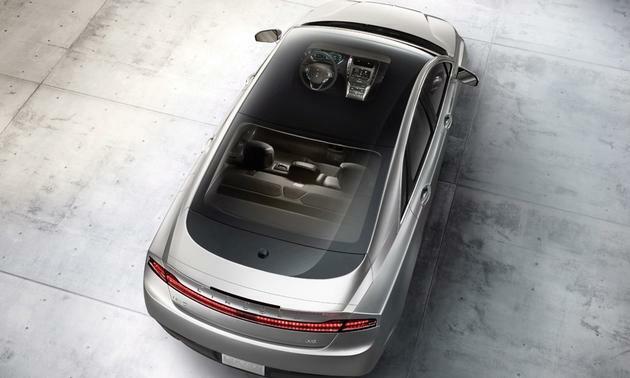 Lincoln thinks that this gigantic, optional 15.2 square foot panoramic glass sliding roof panel will be a defining feature of the new MKZ. This spectacular overhead shot should be everywhere because it really makes the car special. 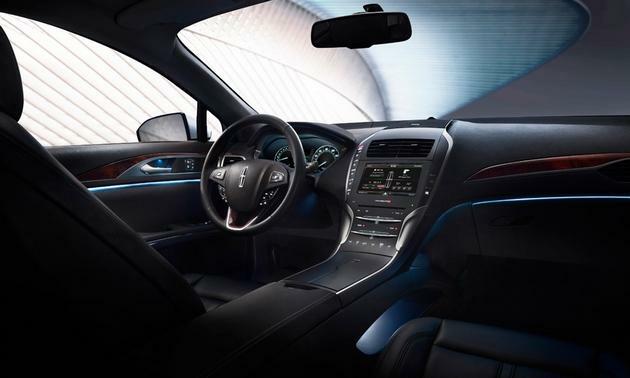 The handsome, futuristic new interior of the 2013 Lincoln MKZ may be hard for older customers to live with. Everything is by touch screen or touch panel. Note that even the traditional transmission shifter is gone in favor of push-button controls on the left side of the center console. The 10.1" full-color navigation and control screen is lovely and at the proper height. Notice the transmission selection buttons to the right of the steering wheel, on the center panel. Mercedes-Benz: Mercedes is revamping its SUV line up. 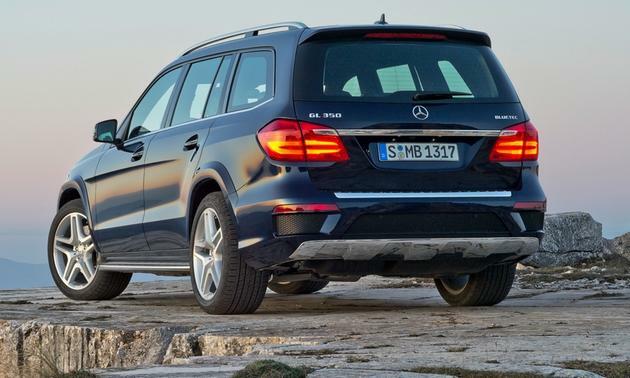 First was the ML, followed by the GLK (to better compete with the BMW X1 and now the full-size GL). I’ve always liked the GL because it seems to wear its angular styling like a beautiful Hugo Boss suit. The styling for 2013 continues the previous angular styling language, but with rounded edges and a more prominent nose similar to what we first saw on the 2012 ML. The three-row, seven seat 2013 GL comes with three engine choices, as before, but with some new hardware. The GL350 BlueTec diesel is powered by a revised 3.5L V6 common-rail injection turbo-diesel good for 240 hp and an intoxicating 455 lb-ft of towing torque. As you’d expect, the diesel will be the fuel economy leader. The GL450 has a 4.7L V8, as before, but this time it’s part of Mercedes’ all-new architecture that uses direct injection and twin turbos to pump out 362 hp and 406 lb-ft of torque. The top-line GL550 ditches the naturally-aspirated 5.5L V8 in favor of the same 4.7L V8 twin-turbo in the GL450, except the output is up to a whopping 429 hp with a gut-wrenching 516 lb-ft of torque, surpassing the diesel (but much more thirsty). All engines are mated to Mercedes’ latest 7-speed automatic transmission with 4-Matic all-wheel drive as standard equipment. As usual, Mercedes-Benz promises the very latest in advanced safety technology, including a slew of airbags and air curtains, optional blind-spot detection, lane keeping assistance, cross-wind stabilization and Pre-Safe Braking that will stop the car for you if it senses an eminent crash. 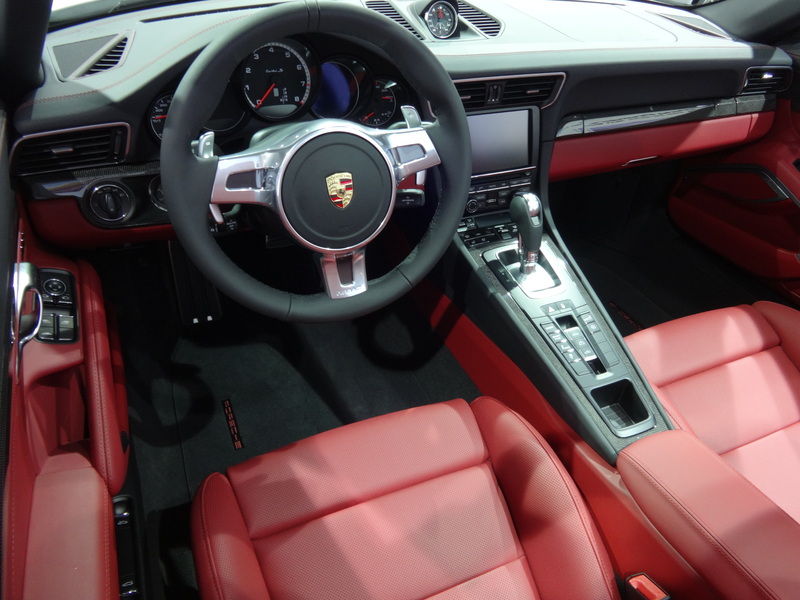 My favorite new option, however, is the optional Designo quilted seats. Expect them to be expensive. 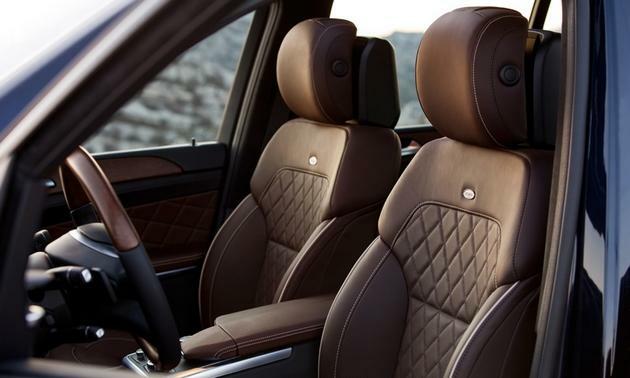 These Designo quilted seats on the 2013 Mercedes GL look divine and I'm sure the price will choke a horse. The GL is assembled at Mercedes’ Tuscolusa, Alabama plant for the worldwide market. Expect the GL350 diesel to start around $63,000, the volume leader GL450 to start at $64,000 and the mighty GL550 to start in the $87,000 range. This 2013 GL350 BlueTec (diesel) as well as the V8 models are fitted with a full array of LEDs. If there is a contest between Mercedes and Audi as to how many LEDs can adorn the front of a car, I think the new GL may win. The GL is basically a large, boxy wagon. Sort of like the German version of the long-gone but glorious Jeep Wagoneer. 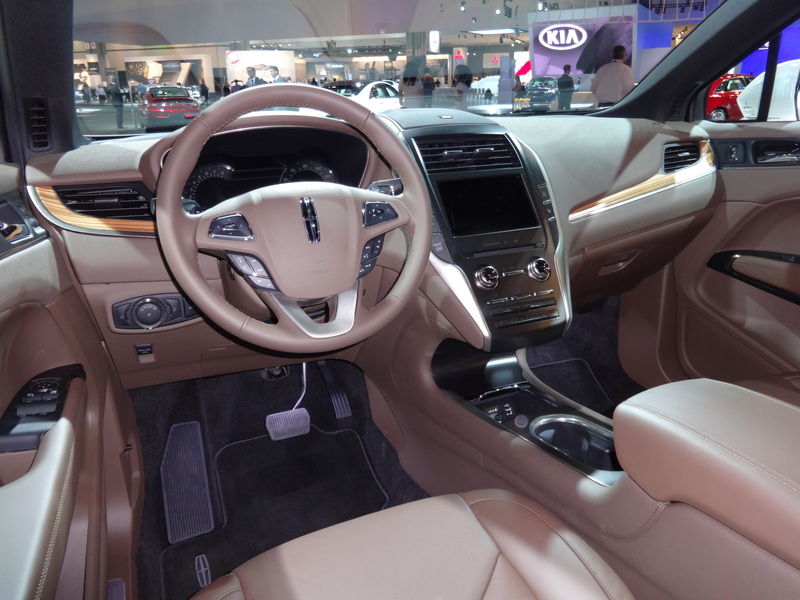 The interior of the new GL is beautifully appointed with rich materials and pleasing, horizontal lines. Of course, the latest version of Mercedes' infotainment system, COMAND, is at the driver's eye level to reduce distraction. Nissan: Nissan is rolling out five new or refreshed models in the next 15 months. First up is the company’s volume leader, the Altima. The Altima is an all-important vehicle for Nissan as it accounts for roughly one third of its total U.S. sales. Last year, Nissan sold 268,981 Altimas. The refreshed styling looks much more like Nissan’s flagship sedan, the Maxima. That’s a bit odd because the Maxima is getting a bit tired and in need of its own refresh. The 2013 Altima comes standard with a new 2.5L inline four with variable valve timing, but no direct injection. It pushes output up to 182 hp and 180 lb-ft of torque. Mated to another continuously variable transmission (CVT), Nissan says the Altima will return 27 mpg city/38 mpg highway – a marked increase over the outgoing model. Nissan’s 3.5L V6 carries over and with the CVT, it has improved fuel economy of 22/30. The Altima also went on a diet and lost 79 pounds while increasing the use of high-strength steel leading to a claimed 30% increase in structural rigidity. A sophisticated multi-link rear suspension is good news for both ride and handling. NissanConnect is standard, and with Bluetooth 2.0, makes fast and easy connection with smartphones. The base Altima comes in at $21,500, just $1,000 more than the last generation base model – but you do get more kit and a better car for the money. I think it’s a good, safe refresh and it will continue to be a volume leader for Nissan. 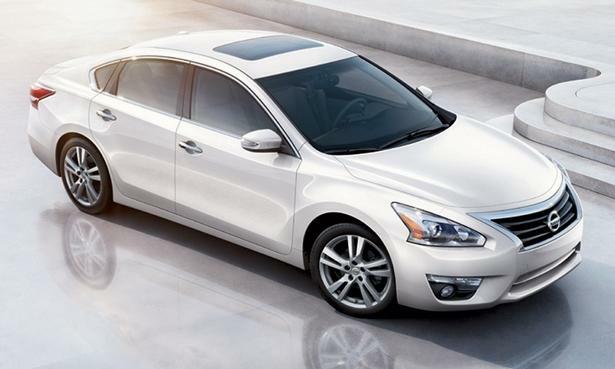 The interior of the 2013 Nissan Altima shows a more mature, rich design. The seats are supposedly specially designed to reduce fatigue. 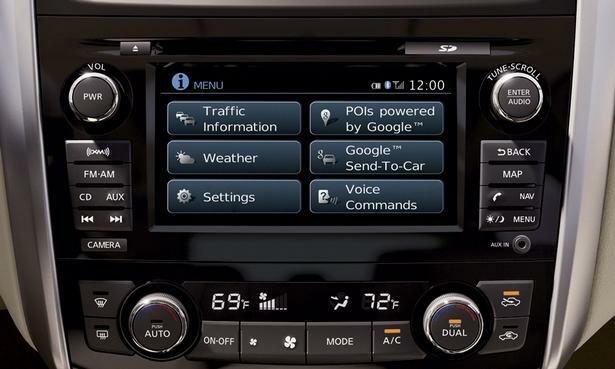 The new NissanConnect infotainment system should make using your smartphone easier. The controls are a combination of old-fashion knobs and a modern touch-screen. It's nice to have a rear view camera and dual-zone automatic climate control. It all looks upscale. SRT: Street and Racing Technology. Historically, SRT was the in-house tuning brand applied to all Chrysler Group brands. However, about a year ago, Ralph Gilles, the talented designer of the original Chrysler 300 and the Senior Vice President of Design for the Chrysler Group, was asked to lead SRT into its own brand identity. Gilles is now President and CEO of SRT in addition to his VP of Design duties. Lucky man. Rumors were flying that the new Viper would be built on an Alfa Romeo 8C platform, but that was all a smoke screen. 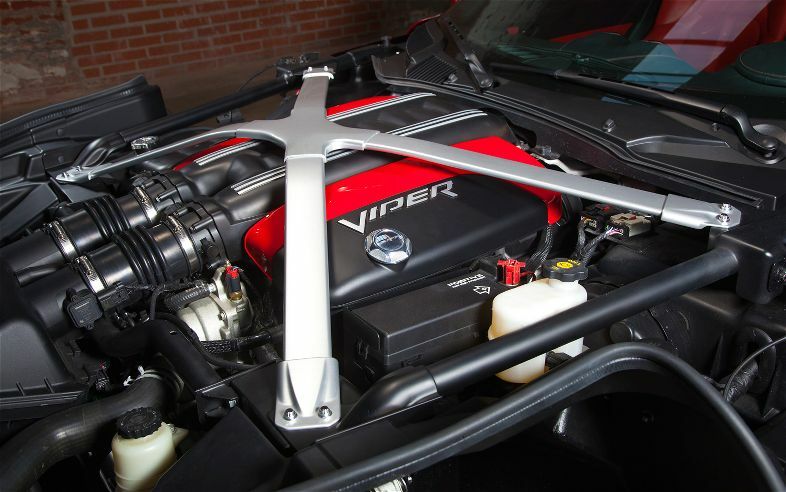 The Viper has updated the outgoing chassis and upgraded the Viper’s signature V10 engine. Here are the numbers: The all aluminum 8.4 liter V10 engine packs 640 hp and 600 lb-ft of torque. 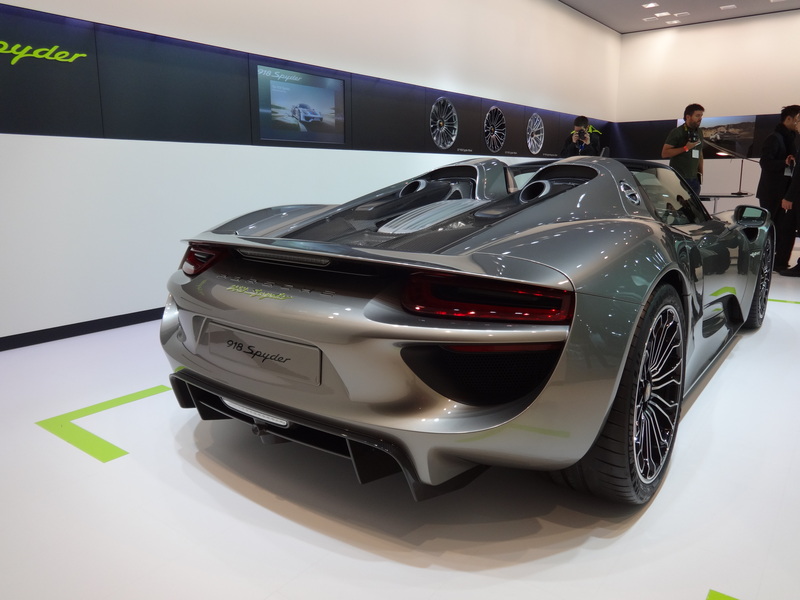 All that power is sent to the rear wheels via a 6-speed manual transmission. At launch, no automatic or dual-clutch automated manual is available. Yet. For the first time, the Viper will get stability control; however, there is an off switch. It also gets a much more civilized and handsome interior. It weighs approximately 3,350 pounds and balances the weight at nearly a 50/50 ratio, front to back. SRT says the Viper should top out at 206 mph. 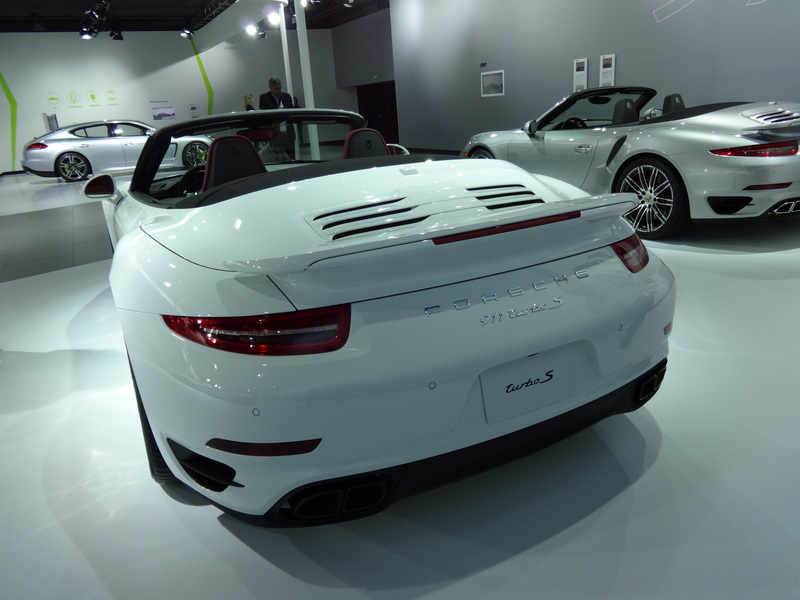 Prices haven’t been announced, but Car and Driver estimates a price tag in the $120,000 range. Get in line, they will all sell. 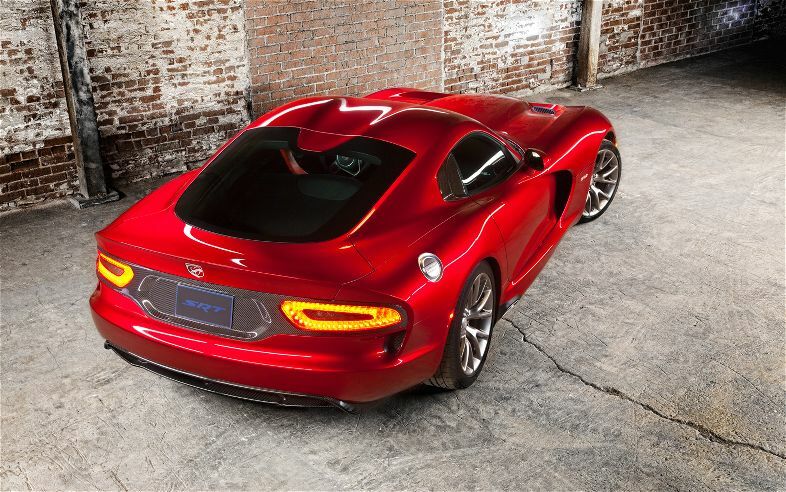 The 2013 SRT Viper is stunning at every angle. 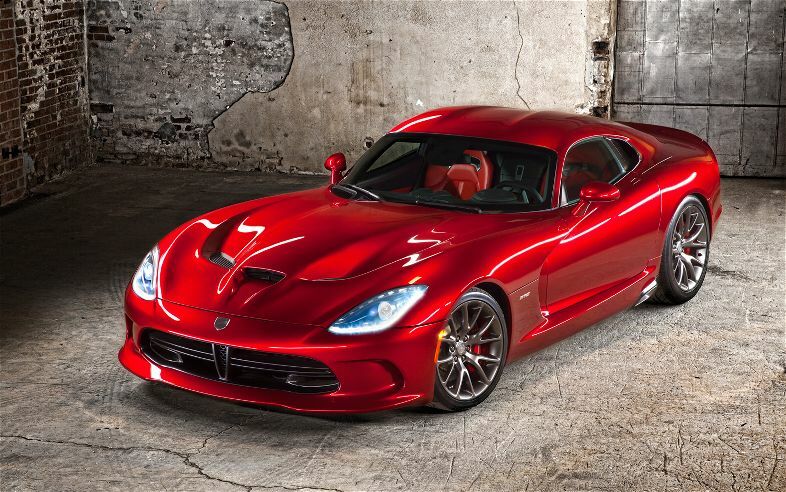 The 2013 SRT Viper. I love the taillights, all LEDs, of course. Red seems a very fitting color for the new snake. The Viper's V10 engine is a thing of beauty under those fantastic cross-braces. SRT says the cross-braces help increase structural rigidity by 50 percent! 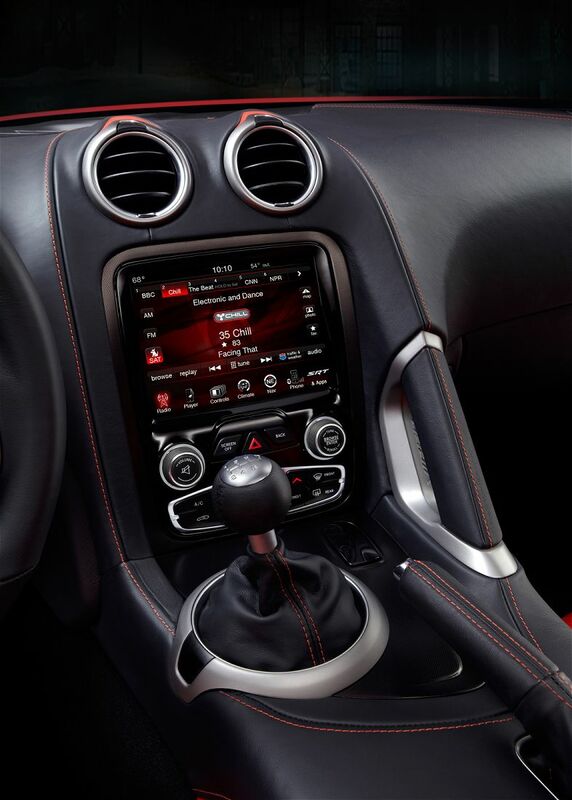 The new interior of the Viper GTS is just stunning with the red and black Nappa leather. The thin-shell seats are sourced from the same vendor used by corporate cousin, Ferrari. Wow - a fully functional center stack with real amenities including the excellent, easy-to-use corporate infotainment system found in other Chrysler products. The contrasting French stitching is a nice touch. The interior finally catches up to the boy-racer greasy bits underneath. Subaru: Last year, Subaru introduced an all-new Impreza, its volume sedan and hatchback. 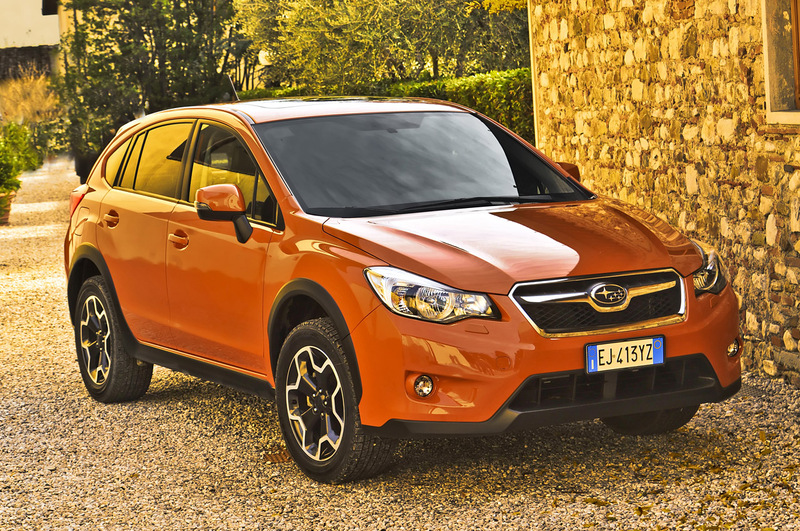 Variants inevitably follow any new Impreza and first up is the 2013 Subaru XV Crosstrek. It’s basically an Impreza Sport (a 4-door hatchback) that’s raised 9 inches with a black-cladded sill, cool new wheels and roof rails. 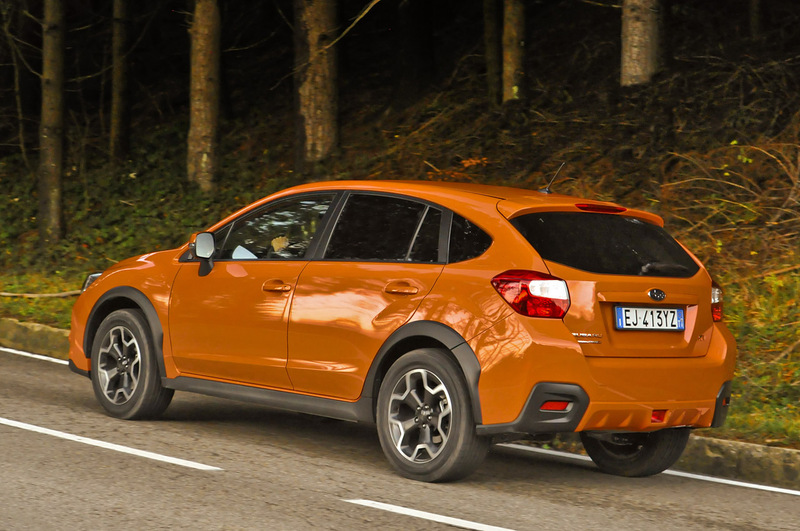 The XV Crosstrek has the same 2.0L 148 hp, 145 lb-ft of torque boxer engine found in the Impreza. Transmission choices are a 6-speed manual or Subaru’s Lineartronic CVT. Of course, the company’s symmetrical all-wheel drive is standard. No matter how you slice it, you won’t be breaking any speed records and climbing steep grades will tax the engine. 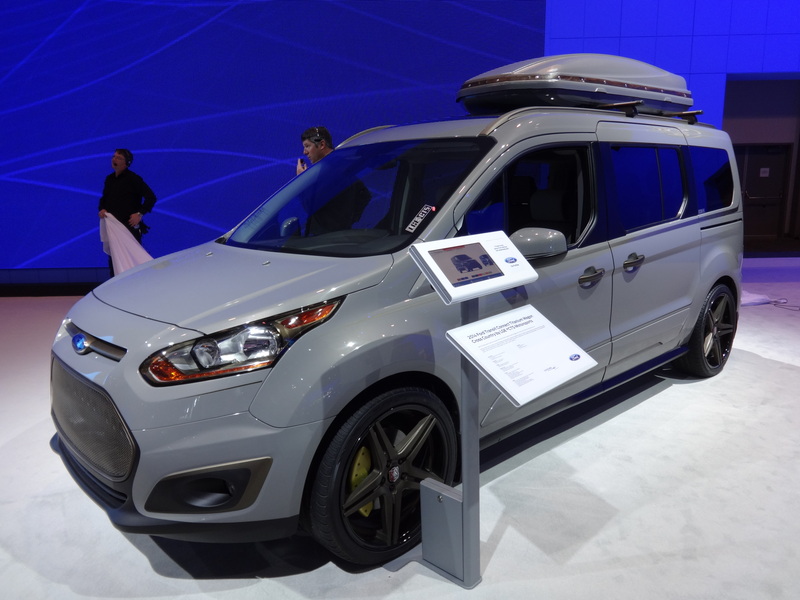 The XV is a “active lifestyle” vehicle, ready to carry a surfboard or bicycle, go camping or skiing. 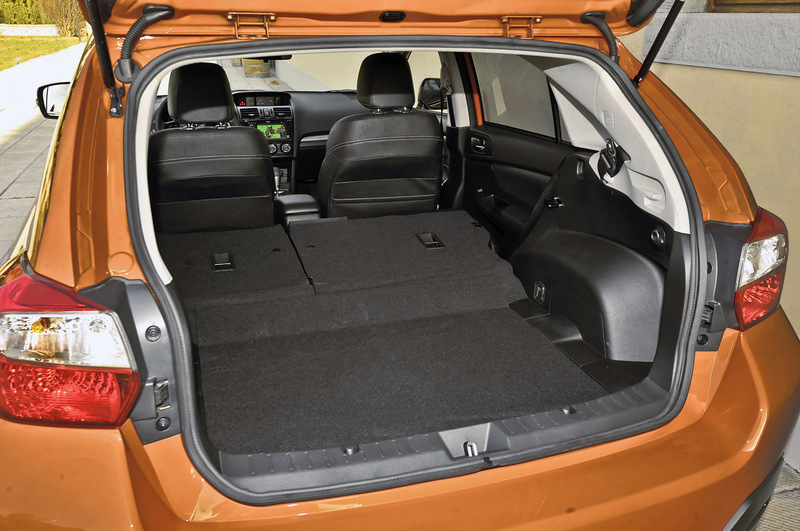 Cargo is good at 52 cubic feet with the rear seats folded flat. Subaru says the XV Crosstrek is good for 25 mpg in the city and 33 mph on the highway. It should start around $23,000. There is no question that the 2013 Subaru XV Crosstrek will be a hit with the Subaru faithful. The Impreza Sport is always in short stock, many selling even before they are delivered to the dealer. The XV will enjoy the same high demand. The 2013 Subaru XV Crosstrek. Love the orange paint and black-painted wheels. The extra 8.7 inches of ground clearance give the driver of the XV Crosstrek a commanding view of the road without being a mammoth SUV. The 2013 Subaru XV Crosstrek has a large hatch and the back seats fold flat for ease of loading and unloading cargo. The cockpit of the XV is 100 percent lifted from the Impreza. Toyota: Toyota surprised everyone in New York with the redesigned Avalon. The Grand Dowager of Toyota has traditionally been a Buick for customers who gave up on Buick. Large, spacious, cushy and semi-plush defined the interior while deadly boring styling clad the exterior. Well, no more. 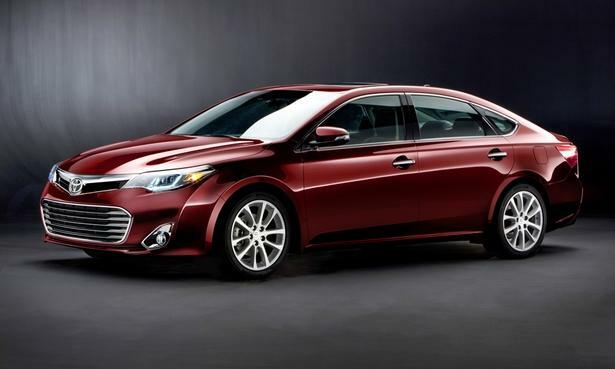 The 2013 Toyota Avalon is a complete re-imagining of the Toyota flagship. While the styling is derivative – I see a Camry nose on top of the new Fusion’s trapezoidal grille and from the rear it looks like the all-new Hyundai Azera. 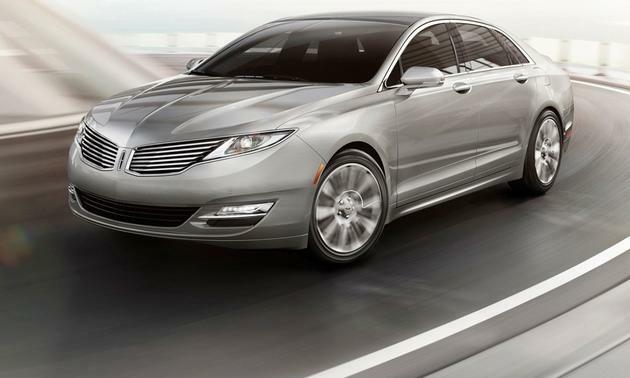 The sweeping headlights have the look of the new Lincoln MKZ. All this is a good thing, because it makes the Avalon competitive in this larger near-luxury sedan category that includes the redesigned 2013 Hyundai Azera, the 2012 Buick LaCrosse, the Chrysler 300 and the 2013 Lincoln MKZ. Toyota was short on specifics, but since the Avalon is built on the Camry platform, it’s likely to have at least the corporate 3.5 liter V6 engine, which in the Camry, has 268 hp and 248 lb-foot of torque. A six-speed automatic is the only transmission. From the pictures, you can see that the new interior is about as close to a Lexus as a Lexus. The current base Avalon is $33,195 and I’d expect the new Avalon available late this year to be in the same price range. The 2013 Toyota Avalon. 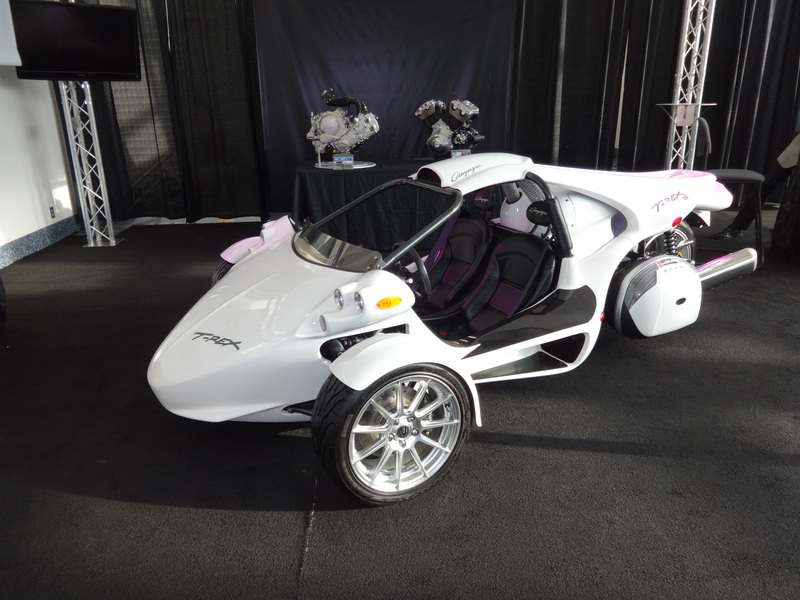 Who knew Toyota could design and produce such a sleek vehicle? It will be built in Toyota's Georgetown, Kentucky plant alongside the Camry. The new Avalon takes its styling cues from the four-door coupe school. The C-pillar sweeps into the trunk at a rakish angle giving the illusion of a coupe. The Mercedes CLS started the trend and it's been picked up by many different manufacturers including on the Volkswagen CC and the Audi A7. 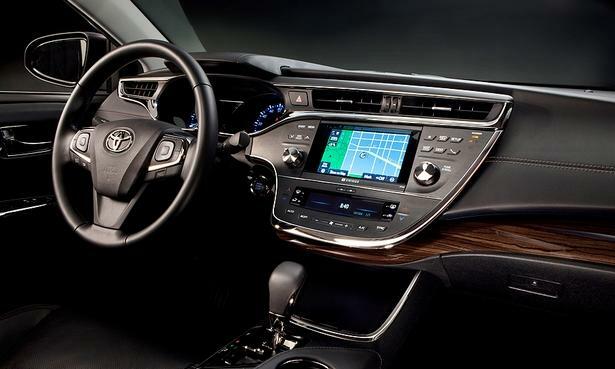 The 2013 Toyota Avalon's dash has real style now and Lexus quality.